Amid the acrimony-filled poll campaign in Gujarat, Congress leader Rahul Gandhi today attacked Prime Minister Narendra Modi but promised he would not use even one "galat shabd" (wrong word) against him because he respects the post of the Prime Minister. Mr Gandhi, who began his second day of campaigning for the second phase of poll scheduled for December 14, said he has learnt from the history of the Congress and the legacy of party leaders like Mahatma Gandhi and Sardar Vallabhbhai Patel that one should "defeat his enemy with love". "Modi ji uses wrong words regarding me, talks senseless things, and did once in today's speech as well. I would like to tell everyone from both the BJP and the Congress that Rahul Gandhi respects the position of the prime minister. 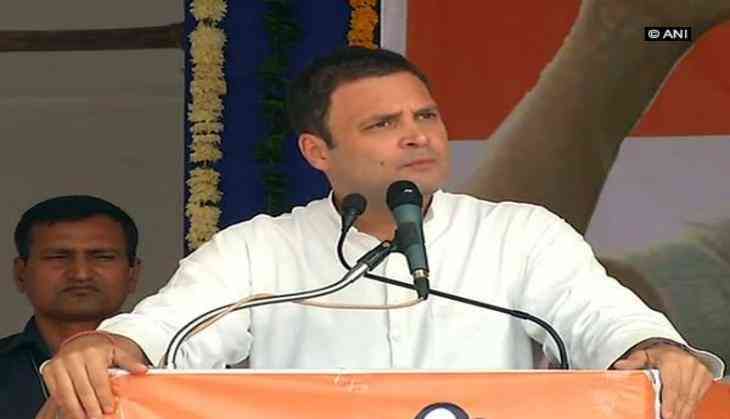 However offensive words the prime minister uses about me, Rahul Gandhi is not going to say a single wrong word regarding the prime minister," he said, addressing a poll rally in Kalol. "And in Gujarat, we are going to defeat you with love, Modi ji," quipped Mr Gandhi, who is set to assume the reins of the Congress in a few days from now. During the day-long campaigning, Mr Gandhi offered prayers at Ranchhod Raiji temple at Dakor and Shamlaji temple at Shamlaji. Exuding confidence that his party would dethrone the BJP from power in Gujarat, Mr Gandhi said the Congress government would listen to the people instead of delivering "Mann Ki Baat" as "Modi ji, (BJP president) Amit Shah ji, or (Chief Minister Vijay) Rupani ji do". Mr Gandhi targeted the PM over speeches in his rallies claiming he frequently changed the election planks and now he was left with nothing to speak about but himself and the Congress. "You claim you have finished the Congress. If it were so, why would you devote half your speech to Congress and half to yourself?" he asked the Prime Minister. "The reason behind this is that Modi ji has nothing to say regarding either 22 years of the BJP rule in the state or about his future agenda for the state. The reason is that because of his false promises, today you do not trust Modi ji," he told the gathering. Mr Gandhi also said that the assembly elections in Gujarat were not about PM Modi or himself or the BJP or the Congress but about "the future of the people of Gujarat". He accused the Prime Minister of not talking about his future plans for the state and "keeping mum" on the issue of corruption. He questioned the Prime Minister over his "silence" on the agitations by various communities, including Patels, Dalits and anganwadi workers. Mr Gandhi said the truth had caught up with the BJP. The Opposition leader also attacked PM Modi over last year's notes ban and the Goods Services Tax (GST), saying the notes ban helped all "thieves" convert their "black money into white" and the "Gabbar Singh Tax" destroyed small businesses and rendered lakhs of people jobless. He also raised the issue of BJP chief's son Jay Shah's business dealings whereby he allegedly "converted Rs. 50,000 into Rs. 80 crore". He also attacked the Modi government for the Rafale fighter jet deal. "Earlier he (Modi) used to say 'na khaunga na khane dunga'. Now he does not utter a word on corruption," Mr Gandhi added.